Delightful jewellery and gorgeous gifts for little boys and girls. Discover beautiful diamond jewellery, collectable beads and charms and cute costume jewellery and jewellery boxes for little girls. Find cute and funky jewellery for fashionable little boys and cool accessories and teenagers. 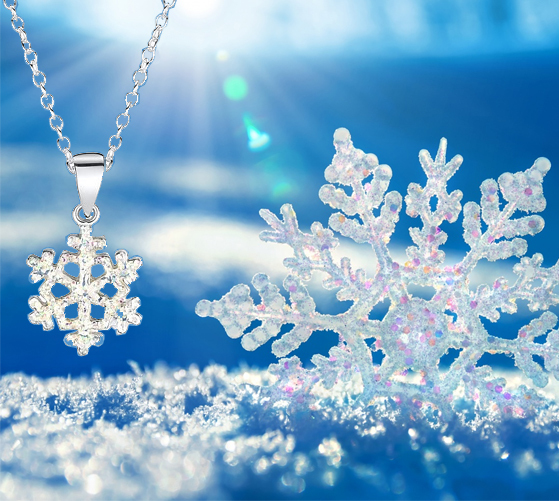 It may be a sunny September day but at Diamond Kids HQ we’re feeling decidedly frosty! Why? 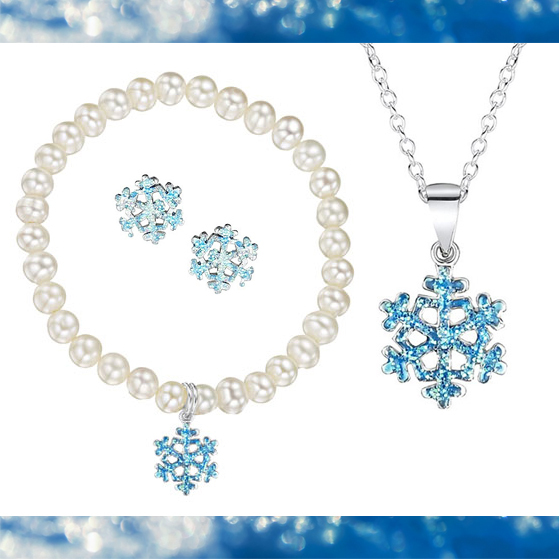 Because this fab new frozen snowflake jewellery has just fluttered into store looking utterly beautiful. Crafted in 925 Sterling Silver with a frosty, frozen finish, these cute little sparklers come on a 14″ chain and are available in frosty white, icy blue or princessy pink. These adorable little freshwater pearl stretch bracelets measure approx 14cm and make the perfect party piece for little Frozen fans. 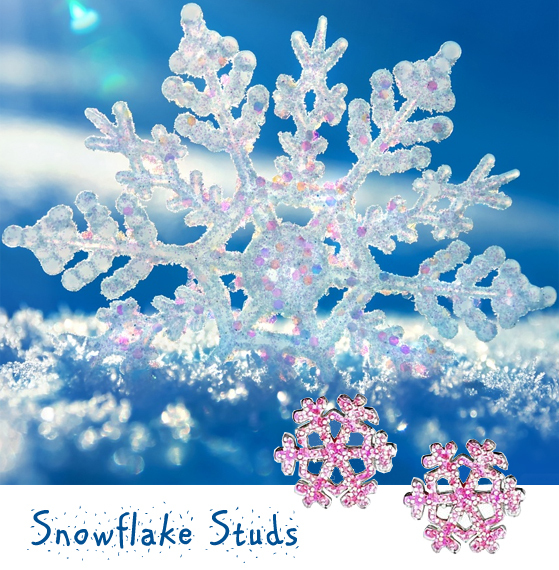 Team with the matching snowflake studs and your little one will feel like a real party princess! Which is your favourite, pink, white or blue? Which little girl doesn’t want to grow up to be just like their Mum when they are older? Wasn’t it Marilyn Monroe who sang that Diamonds are a girl’s best friend and Elizabeth Taylor who declared that big girls need big diamonds? With Diamond Kids, diamonds can be the best friend of any girl, no matter your age. You are never too young to own your first diamond. Diamonds do not necessarily mean massive expense and they make a fantastic present for adults and children alike. Have you ever needed to buy a special gift but did not know what to buy? Have you ever thought about buying a special little girl her first diamond? It could be your daughter, niece, granddaughter or goddaughter? Have you struggled for ideas of what to buy her? Established in 2003, Diamond kids have a wide range of accessories available ranging from the super cute to pieces you wish were available in adult size! There are many occasions to buy a girl’s first diamond, the birth of a beautiful girl, a birthday, Christmas, Holy Communion and Christenings for example. We have beautiful pieces in stock to suit all occasions, all budgets and all children. Whether you are looking for a necklace, stud earrings, bracelet, bangle or watch, in sterling silver, white or yellow gold, here you will something for every special little girl. Every little girl is different and likes different things, some girls are girly and love to feel like princesses with pretty earrings and other jewellery, whilst others are a lot less showy and ‘tom boyish’ and would feel happier wearing a subtle watch with a single diamond, with Diamond kids you will find something to suit the personality of every little lady. If you are thinking of buying the special little lady in your life a diamond for their birthday or are looking for a gift for a newborn little girl and are on a budget see our girls birthstone pendants. These are gorgeous sterling silver necklaces with a birthstone and single diamond, are available at an amazing price of only £39.95. Also available are birthstone bracelets, priced at an unbelievable £59.95, these bracelets are gorgeous for any little girl and would make an ideal Christening bracelet or Christmas present for any aspiring princess. These gifts are wonderful keepsakes, and come in a lovely presentation box to keep them in immaculate condition. There are many other girls diamond bracelets available. These would make fantastic Christening presents; these girls’ bracelets range in price but are all amazing value for money. Here you can find all items which are guaranteed to suit your requirements – gold, silver or white silver. Many bracelets are expandable, meaning that they last for many years and are then available to be passed on through future generations. For school age children, it may be nice for them to have a piece that they can wear all of the time, it doesn’t necessarily have to be a special item that they cannot wear very often. This could be diamond studded earrings that are allowed to be worn to school or a subtle watch with a single diamond in the clock face. Find amazing value girls watches here. A girl should be able to feel special at all times! The items are beautifully crafted and are absolute fantastic value for money taking away the concern for allowing them to wear it for everyday use. After all, diamonds are forever!